Kenzō (顕宗天皇, Kenzō-tennō), also spelled Ghen-so-tennō, was the 23rd emperor of Japan, according to the traditional order of succession. 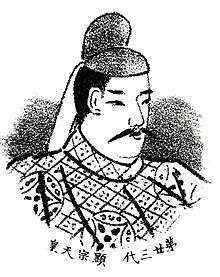 No firm dates can be assigned to this emperor's life or reign, but he is conventionally considered to have reigned from 485 to 487. Prince Oka, later to become Emperor Kenzō, is said to have been the grandson of Emperor Richū, and the son of Ichinobe-no Oshiwa. He would have been quite young when Emperor Yūryaku shot the arrow which killed his father during a hunting expedition; and this caused both Prince Oke and his older brother, Prince Ōka, to flee for their lives. They found refuge at Akashi in Harima Province where they hid by living in obscurity. Histories from that period explained that the two brothers sought to blend into this rural community by posing as common herdsmen. It is said that the Prince of Harima came by chance to Akashi; and at that time, Prince Ōka revealed his true identity. This intermediary re-introduced the lost cousins to Emperor Seinei, who had by this time ascended to the throne after the death of his father, the former Emperor Yūryaku. Seinei invited both brothers to return the court; and he adopted both of them as sons and heirs. At Seinei's death, he had no other heirs than Prince Ōka and Prince Oka, whose father had been killed by Yūraku. At this point, Oka wanted his elder brother to become emperor; but Ōke refused. The two could not reach an agreement. The great men of the court insisted that one or the other of the brothers must accept the throne; but in the end, Ōka proved to be more adamant. Prince Oka agreed to accept the throne; and Kenzō was ultimately proclaimed as the new emperor—which created a sense of relief for all the people who had endured this period of uncertainty. 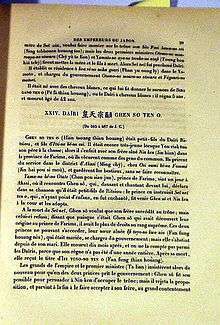 This sample page from Nihon Ōdai Ichiran (1834) represents the first published account of Emperor Kenzō's reign to become available in the West. Kenzō is considered to have ruled the country during the late-5th century, but there is a paucity of information about him. There is insufficient material available for further verification and study. Kenzō's contemporary title would not have been tennō, as most historians believe this title was not introduced until the reigns of Emperor Tenmu and Empress Jitō. Rather, it was presumably Sumeramikoto or Amenoshita Shiroshimesu Ōkimi (治天下大王), meaning "the great king who rules all under heaven." Alternatively, Kenzō might have been referred to as (ヤマト大王/大君) or the "Great King of Yamato." It is recorded that his capital was at Chikatsu Asuka no Yatsuri no Miya (近飛鳥八釣宮, ちかつあすかのやつりのみや) in Yamato Province. The location of the palace is thought to have been in present-day Osaka Prefecture or Nara Prefecture. Murray reports that the only event of major consequence during Kenzō's reign had to do with the filial respect he showed for his murdered father. Kenzō arranged to have his father's remains retrieved and reinterred in a mausoleum appropriate for the son of an Emperor and the father of another. 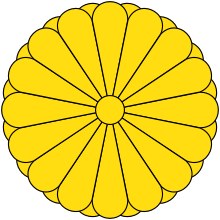 Kenzō died at age 38, reigning only three years. He too had no other heirs; so his brother would follow him on the throne. The actual site of Kenzō's grave is not known. This emperor is traditionally venerated at a memorial Shinto shrine (misasagi) at Osaka. The Imperial Household Agency designates this location as Kenzō's mausoleum. It is formally named Kataoka no Iwatsuki no oka no kita no misasagi. ↑ "Genealogy of the Emperors of Japan" at Kunaicho.go.jp; retrieved 2013-8-29. 1 2 Imperial Household Agency (Kunaichō): 顕宗天皇 (23); retrieved 2013-8-29. ↑ Titsingh, Isaac. (1834). Annales des empereurs du japon, pp. 29–30; Brown, Delmer M. (1979). Gukanshō, p. 259; Varley, H. Paul. (1980). Jinnō Shōtōki, p. 116. ↑ Ponsonby-Fane, Richard. (1959). The Imperial House of Japan, p. 42. 1 2 Titsingh, p. 29. 1 2 Titsingh, p. 30. ↑ Aston, William. (1998). Nihongi, Vol. 1, pp. 377–393.